Hey, that wasn't too bad. 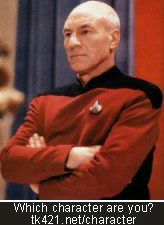 :-) I can't quote Shakespeare, however I do like my tea, Earl Grey, hot. Which Fantasy/SciFi Chracter are you? Well here's something completely different from my Heart Lace Cloth, lol. 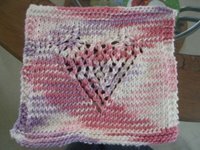 I was trying to design something with a more "solid" fabric cuz I know the dishcloth crowd likes the solid fabrics more than the lacy fabrics. 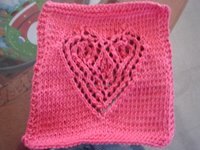 So I've bee playing around with various versions of my 4 Embossed Hearts, and think the one you see below is one the versions in the running for being final one. I really need to catch up on blog reading. 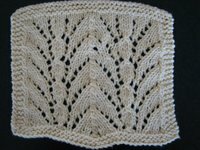 I have a long list of knitting blogs which I'd like to keep up with, but find I'm always trying to catch up with all the old posts. So I've switched over to New Blogger and like the new edit posts screen (the one where it enumerates all the published posts) and how you can easily tag them with labels. 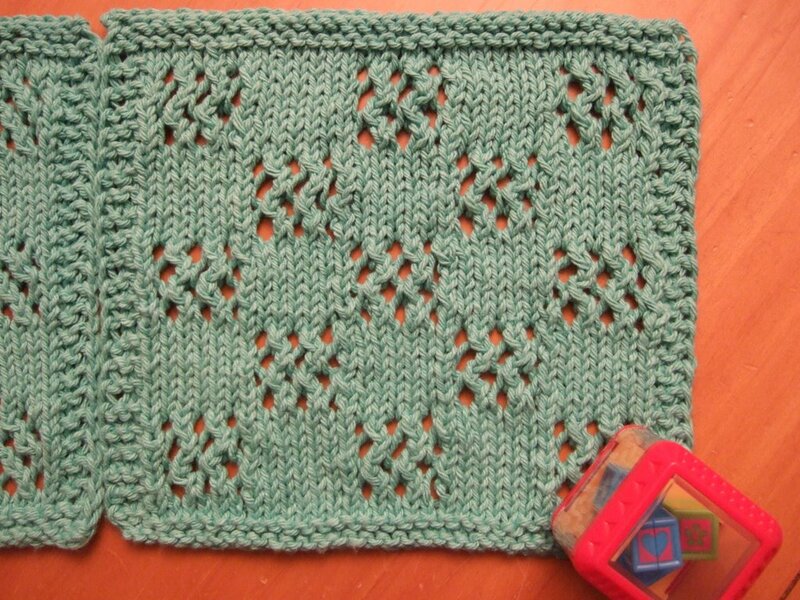 So I started to play around with the labels, adding a "free patterns" label to each of my pattern posts. 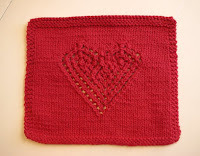 After I was done, I was truly surprised to find that there were 28 free patterns on my blog. Is it really that many? I know I have them on my sidebar, however I never bothered to count them. 28 patterns since Aug 2006, that's an average of 4.6 patterns per months (over the last 6 months). One thing I don't like is how New Blogger has changed the way the comments appear in my Gmail inbox. Comments from the same post show up as one discussion. The comments used to show up as individual email messages in Old Blogger; this made it a lot easier for me to manage which messages I want to respond to (marking those as "to respond" while filing the others away). I guess this old dog needs to learn new tricks to adapt with the new way the comment email show up in Gmail. Anyone have any tips to share? 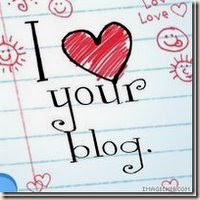 With New Blogger you can see the number of comments for each post. This is very interesting. It is interesting to see which posts have more comments. 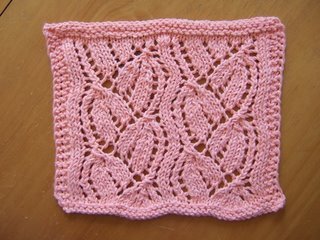 Delurking post aside, I notice that most people were interested in my Persephone Scarf pattern post and my Heart Lace Cloth pattern post. Anyone ever notice how Roger Federer sometimes uses the side of his racquet for the first bounce when he bounces his tennis ball before a serve? Yay, my sore throat is gone, and it's about time! 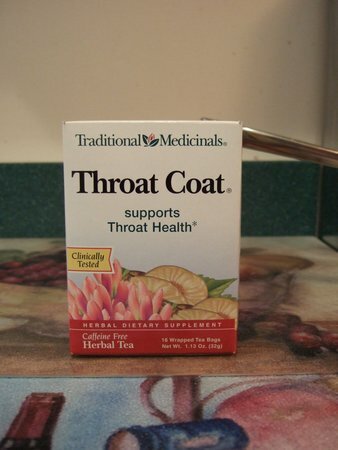 I'm sure the Throat Coat helped. You know how the doc tells you to continue to take a medication even after the symptoms have gone away? Well, I applied the same principle and continued to drink the tea after my throat felt better. It couldn't hurt, right? DH has worked hard at putting out some fires at work, which included long weekend hours and numerous conference calls (as early as 4am!). Things have settled down a bit now, so the higher ups told him he needed to treat himself to something expensive. He told them he'd take a day off. They told him something more than that. So I thought, how about staying at a B&B during our little February getaway? 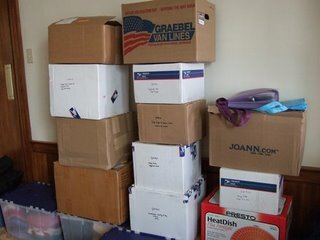 My MIL was originally going to take M for 2 nights in Feb, but then she "wimped out", as DH put it, and said she would do it for 1 night as a trial period since this would be M's first night away from home. So I spent some time trying to find a nice B&B in the Monterey, CA area. Ran into some difficulties which I thought was the last minute planning, but then discovered that it was Presidents Day holiday weekend! I didn't realize that. I only knew it was Chinese New Year weekend. As a result, many places are requiring a 2 or 3 night minimum stay. Well, that won't work with us since MIL is only available to take M for 1 night. Sigh... I was hoping to stay at Grand View Inn (now called the Beach House of Seven Gables Inn). We have stayed in their Julia's and Seal Rocks rooms, the latter being slightly better. Looked at various places in Pacific Grove, Monterey, & Carmel area and didn't come up with anything. Then I realized that we didn't have to go south. It originally seemed like the logical thing to do since we would have to drive south from SF to Fremont (to drop off M). But there really is no reason why we can't head back up north. So I looked into lodgings in Healdsburg, CA (Sonoma wine country) at our other favorite B&B, Grape Leaf Inn. We've stayed in the Chardonnay Suite twice. This time I wanted to try a different room, Roussanne, but it doesn't look like we will be able to stay in that room. They have a 3-night minimum, and since that room is still open for Sat & Sun, they want to make it available to anyone else who may want that room for 3 nights. So, we're going to get Mourvedre instead. BTW, the breakfast at Grape Leaf Inn is awesome! I'm thinking we can drop off M at the inlaws, then head up north to have lunch at Zachary's Pizza in Oakland/Berkeley before checking in at the inn. 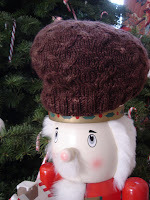 Now the next question is what knitting project will I bring with me? 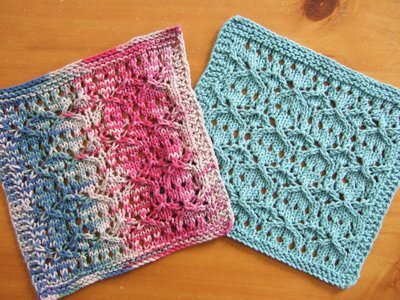 I've also noticed a predilection for garter stitch borders with lacy designs and seed stitch borders with non-lacy designs... hence the garter stitch borders in most of my lacy cloths and the seed stitch border on my Persephone Scarf. 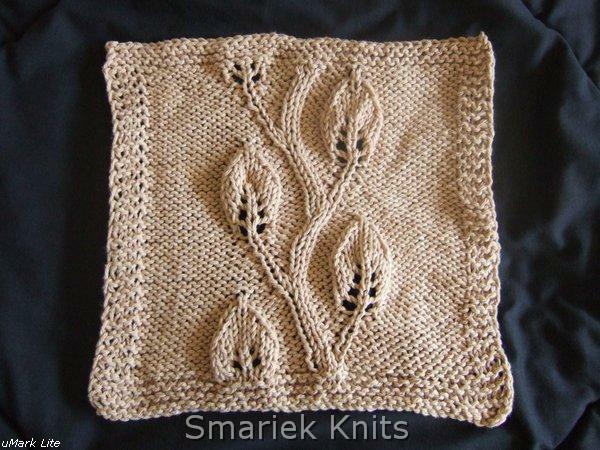 The seed stitch borders with lace just isn't doing it for me. 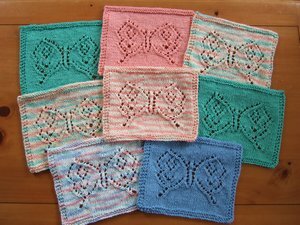 Another thing I noticed is that I prefer to slip the 1st stitch on the garter stitch borders, but not on the seed stitch borders. 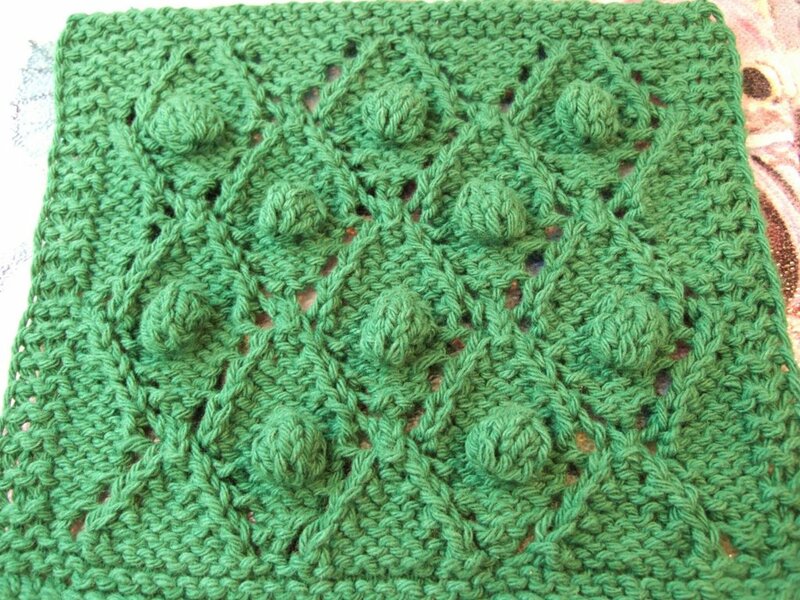 I kinda like the more "rugged" edge on the seed stitch border. 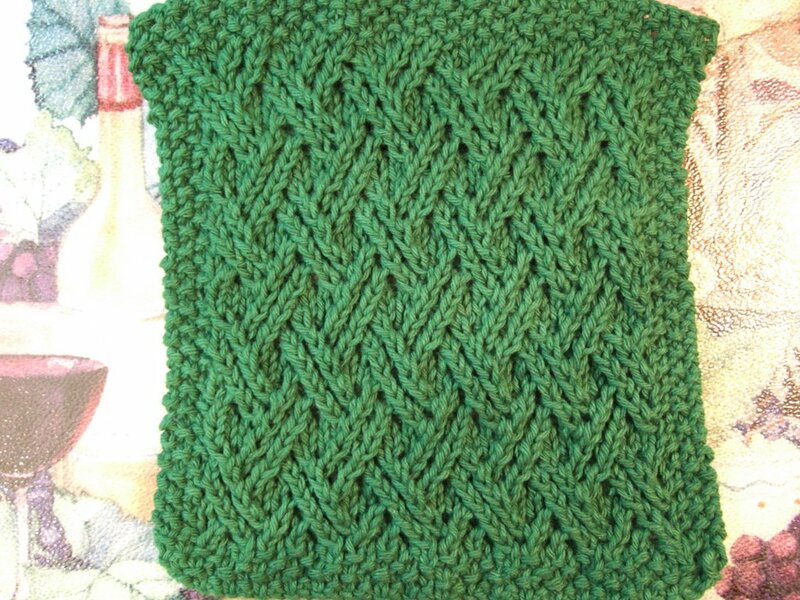 As easy as plain knit/purl stitches are, I find them tedious to work. 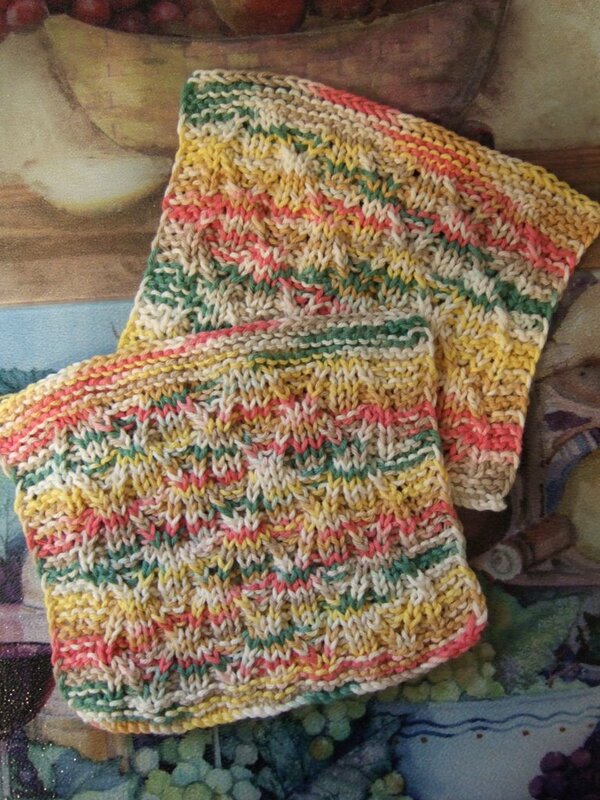 Perhaps that's partly another factor why I prefer garter stitch borders. 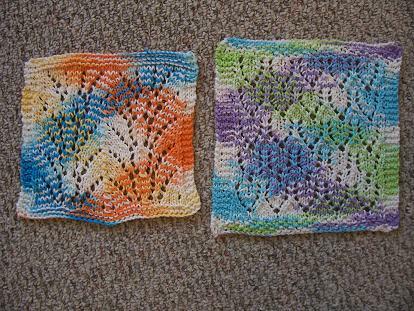 I'm just lazy with passing the yarn back & forth between front & back. 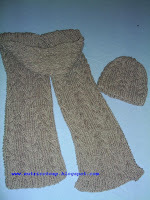 I used thicker yarns (worsted & chunky weights) when I started to learn how to knit. Now I'm seem to prefer lighter weight yarns in the fingerling/DK weights. 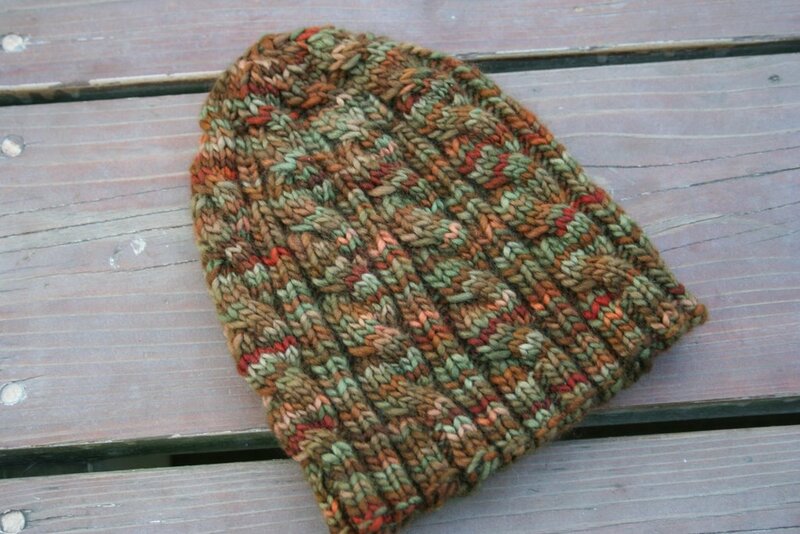 I know this seems strange because it takes longer to knit with the lighter weight yarn, and you'd think I'd stick with chunky yarn given my limited knitting time. 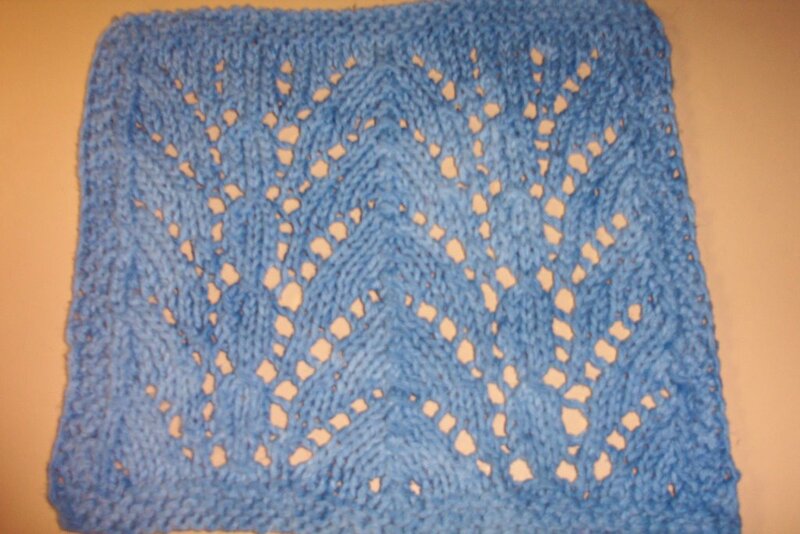 Coupled with my slow knitting, it really takes me a long time to finish something! 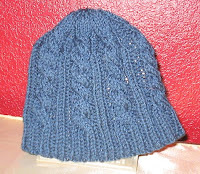 I still use worsted weight yarn mostly for the chemo caps for the Cap Karma chemo cap project. According to the copyright page, it was printed in 1971 Barbara G. Walker. This book was originally published as part of "A Treasury of Knitting Patterns" and "A Second Treasury of Knitting Patterns". Well, after having a chance to peruse this book along with BW1 & BW2, I have to agree with that reviewer. It contains the exact same info. Most of the patterns are even in the same order, some in a different order, but they are all there. Even the introductory text to each section is identical, they just amalgamated the intro from both books. 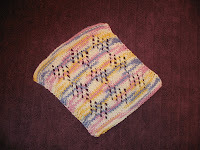 I was hoping for some new information, new tips, new stitch patterns, new something. Now knowing that it is the exact same info as what is already contained in the other two books, I know I do not need to own a copy of this. 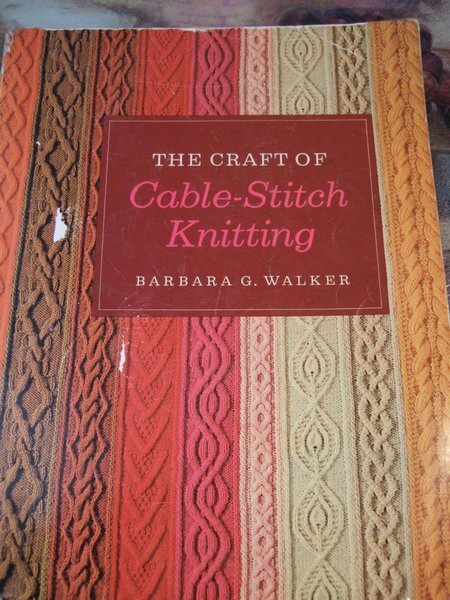 The only possible reason I would want to get this book (maybe if I happened to find it at bargain prices somewhere) would be to have the convenience of seeing just the cable patterns all in one place, in one book. 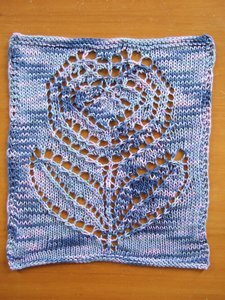 Knowing what I know about this book, I'm willing to bet that her Craft of Lace Knitting book is exactly the same with no new info. -- Finishing up that hat for mom, hopefully before winter is over! 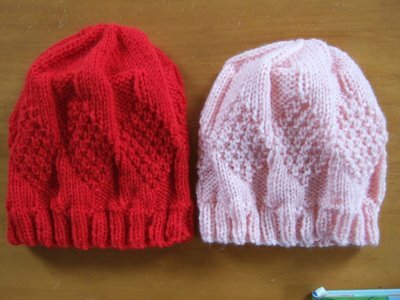 I think it will be amusing to see my mom and DD wearing the same hat pattern in the same pink yarn, will try to take a pic of both of them in their hats. 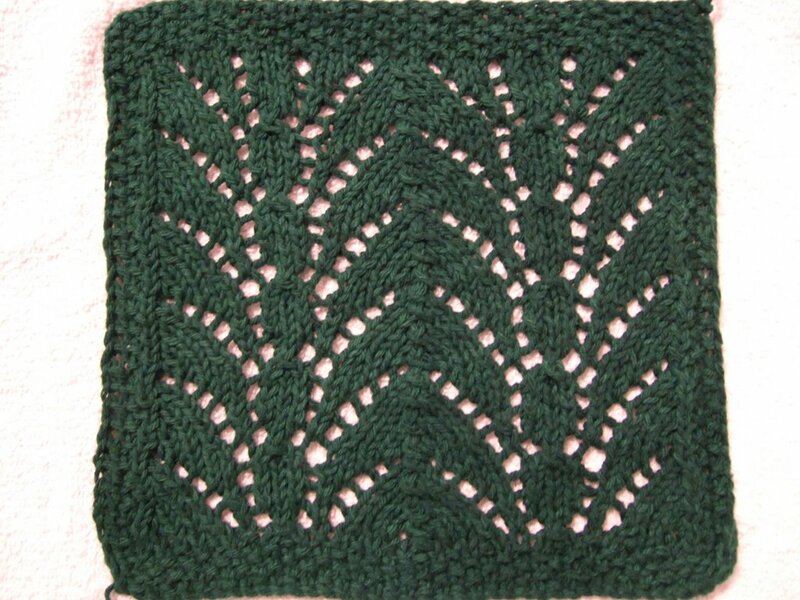 -- Starting that maple leaf cloth for T. I've been meaning to do this for months, but I need to find some time where I can concentrate on this type of pattern. 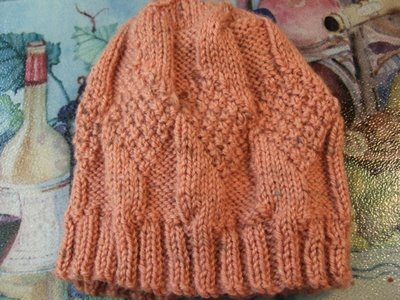 -- Finishing one mitt for DD. 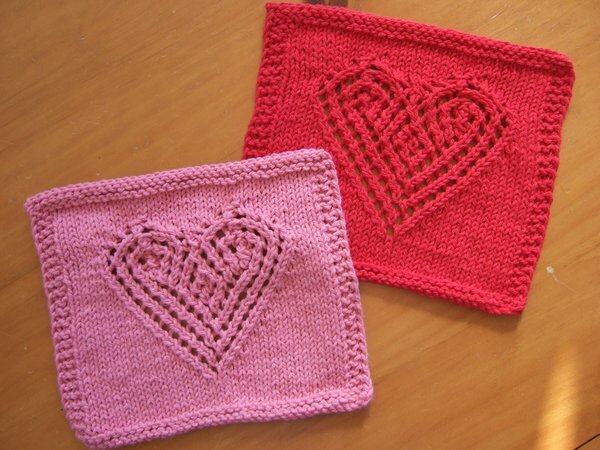 I know I need to make a pair, but I'd be really happy if I could just finish one! 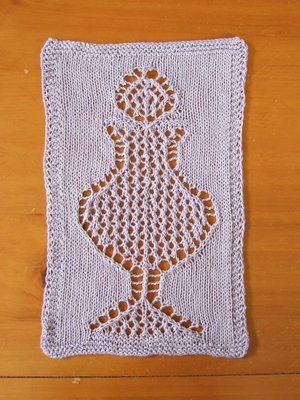 -- Posting my Dayflower Cloth pattern. It is already typed up, I just need to post it when I'm feeling less apprehensive about doing so. 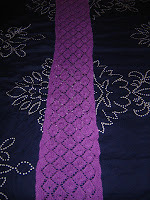 -- Typing up my Miranda Cable Scarf and Ariel Cable Scarf patterns. 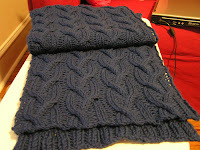 -- Typing up the pattern for my 3AM Cable Scarf (to match my 3AM Cable Hat). 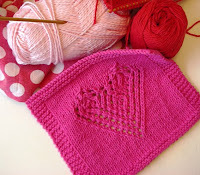 -- Tweaking my 4 Embossed Hearts cloth pattern. I've got several versions going and need to decide which one I like best. I really want to design a cloth with a more solid fabric (viz. non-lacy) cuz I know that is what most people prefer. Jayne: I will have to seek out the tea you mentioned, Traditional Medicinals Echinacea Plus. The last time I went to Safeway, they only had 2 types of TM teas, Throat Coat and Smoove Move. I'll have to look elsewhere. There is an effective zinc lozenge made by Quantum which also has echinacea in it. The stuff works great. Unfortunately they're hard to find as they're not sold in the ubiquitous supermarkets/drug stores. I used to get them at a little health food store downtown near where I used to work. Melissa: You asked about cables without a cable needle. Please see my response to that in this post. 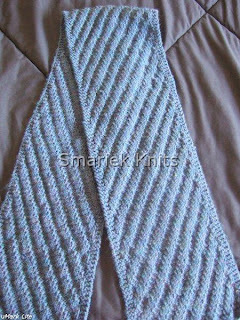 As for the Elann Highland Silk yarn I used for the Persephone Scarf, I believe it is only available directly from Elann. Oh, the purple thing on top of the Joann's box is where I keep all my circular needles. You can see a better picture of it here. 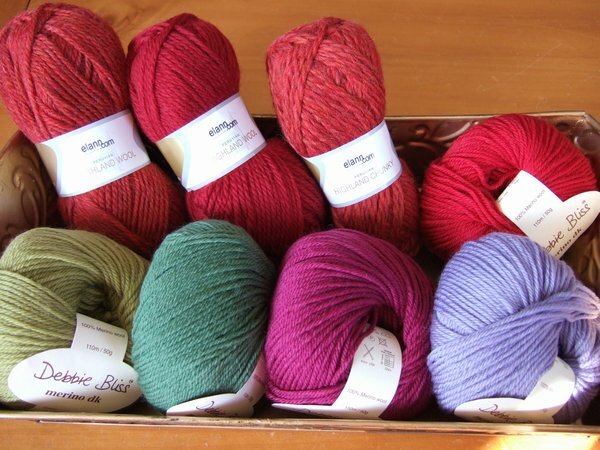 And if you want to see how many circs I have, look here; I don't think I've added any new needles since that post. I still have a sore throat. :-( Sometimes it seems to get better, other times it gets worse. I've been drinking lots of this Traditional Medicinals Throat Coat which seems to help. Am tempted to reach for some essential oils, but am afraid of using this stuff around my DD since some aren't really safe for young children. I am troubled to hear of two people who had difficulties with Row 38 of my Heart Lace Cloth. I responded to Stacey's email 5 days ago, haven't heard back, and assumed she resolved the issue. Now I noticed someone else left a comment about Row 38. 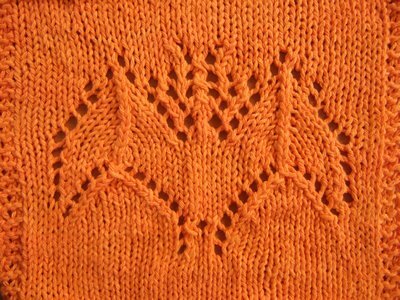 How many stitches do you have after finishing Row 37? 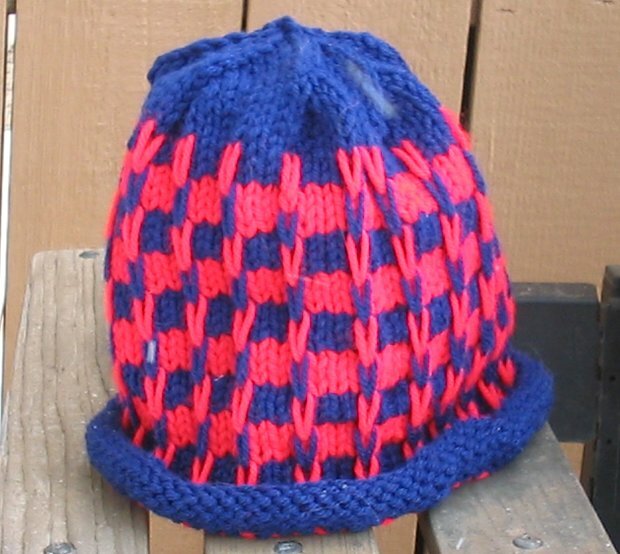 If you cast on 39 stitches, you would have done B3, P33, B3 and ended up with 39 stitches. 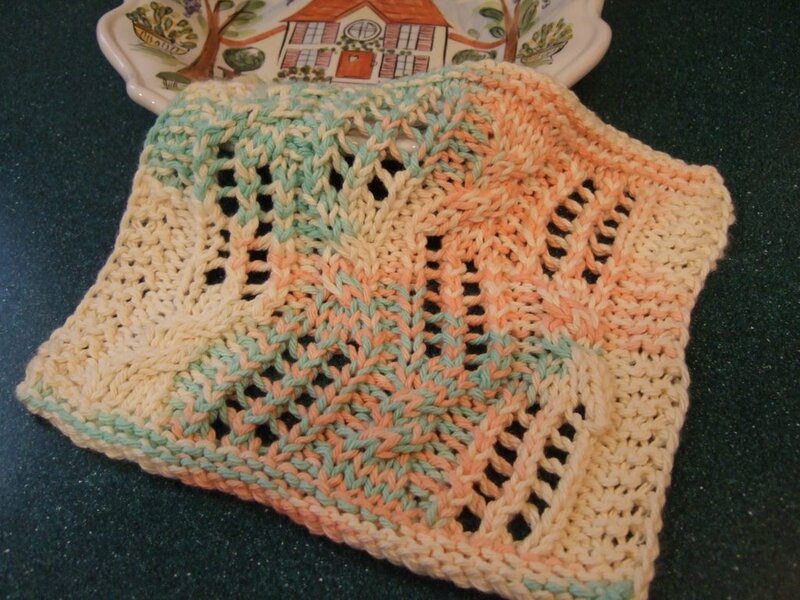 If you cast on 37 stitches, you would have done B3, P31, B3 and ended up with 37 stitches. 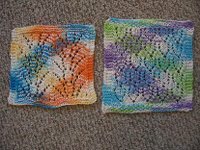 If the number of stitches you purled is not correct, then you might have made a boo boo in Row 36. On the upside, I do know of two people who have successfully knitted up the Heart Lace Cloth, and neither of these two ladies mentioned any difficulties with row 38 (or any other row). 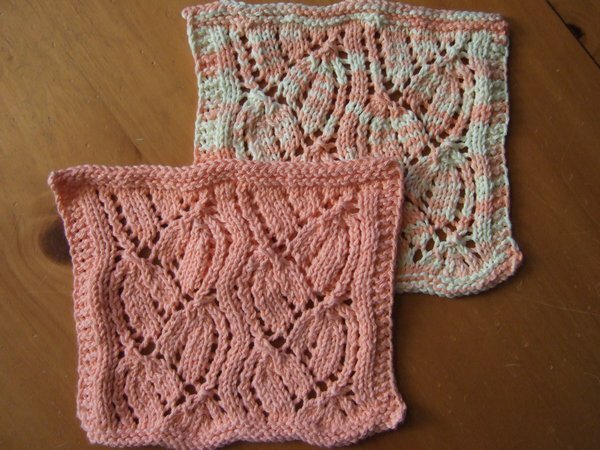 Rhoda knitted two cloths (I love that Pink Lilacs color she used in one of them), and Mary knitted one. 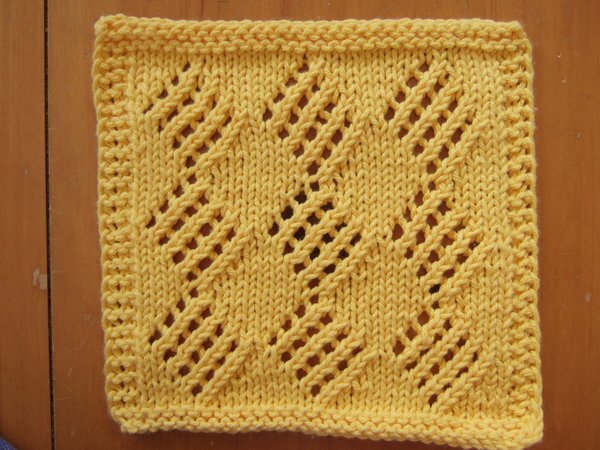 Mary mentioned that my M1 instruction "really means M1, K1 in standard knitting pattern terminology". Sorry about the unconventional M1. As a newbie knitter, I'm still trying to figure out what is standard. It seemed logical to me at the time to use M1 (to stand for "make one") for that increase. I used D4 similarly for decreasing 4 stitches. I'll bet D4 is not standard either. Does anyone know what my D4 really should be called? I guess my SWAGs on abbreviations aren't such a good idea, lol. Well I guess I'm not off to a very good start with Stash busting this year. I placed an order from Elann on 1/16 (last Tues) , so I guess I only made it as far as half the month. I didn't receive my little white box until today (Tues) by no fault of Elann. Their box arrived at its destination last Friday, as expected, but I had it delivered to DH's work and it had been sitting in his car ever since. He finally got it out of the boot this morning. I didn't find out about the box until yesterday night (Mon) when I mentioned to him that I was expecting a package from Elann. That's when he remembered and told me that he received it on Friday. 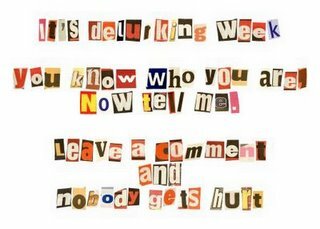 I don't blame him for forgetting on Fri or Sat, since there was a big "meltdown" at his workplace ever since he walked into the office on Friday morning which bled into the weekend. But he should have remembered to tell me on Sunday. Anyhows, it was quite a challenge to take this photo. I had to place the balls in that tray so that I could quickly move the whole set out of the way when DD tried to grab at the balls. She already grabbed at the lavender ball; you can see how it is not quite as "neat" as the other balls. In the back row from left to right: Highland Wool in Red Maple, Higland Wool in Ruby (I loved the color of my Persephone Scarf using Highland Silk in Ruby, that I had to get the same color in HW), Highland Chunky in Red Maple, and Debbie Bliss Merino DK in Tomato. In the front row from left to right: Debblie Bliss Merino DK in Fresh Olive, Pine Green, Cyclamen, and Lavender. Ok, now the big question is .... where will I put all these balls? 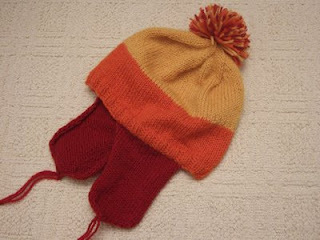 I had originally thought of them as a few balls of this color, a few balls of that color, but CBM had to go and quantify the order as 62 balls of yarn. Gosh, is it really that many? It certainly puts things in a different perspective when you're thinking of an actual number, lol. Sorry, haven't had much time to post lately... busy busy busy ... tired tired tired (it was a long week/weekend, long story, won't bore you with it) ... somebody please send me a babysitter for 3 days. I have lots on my mind but can't remember what I want to say when I finally find some time in front of the computer. 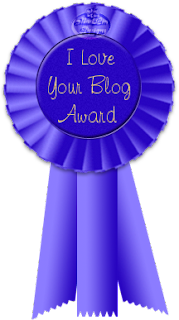 I wish I could blog in my sleep. Since I have a bit of insomnia, I'm often lying in bed thinking about what I want to do. This usually includes what I want to write in my blog plus replying to email. Sometimes I do all this stuff in my head while lying in bed, and then later forget that I haven't actually done it. lol. I haven't yet decided whether writing or fiddling around with photos takes more time. I guess they're about equal. This blogging thing sure does take a lot of time! lol. 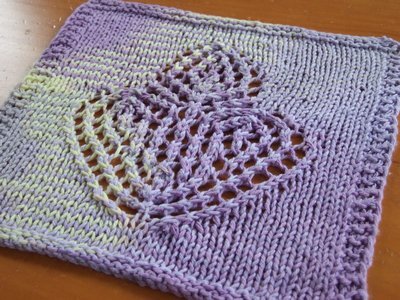 I've been thinking about using the ubiquitous Dayflower pattern for a wash cloth for some time now, and I finally got around to doing something about it. 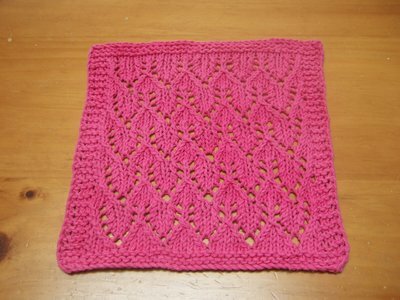 I think it is a lovely pattern, and will use it for a scarf someday. 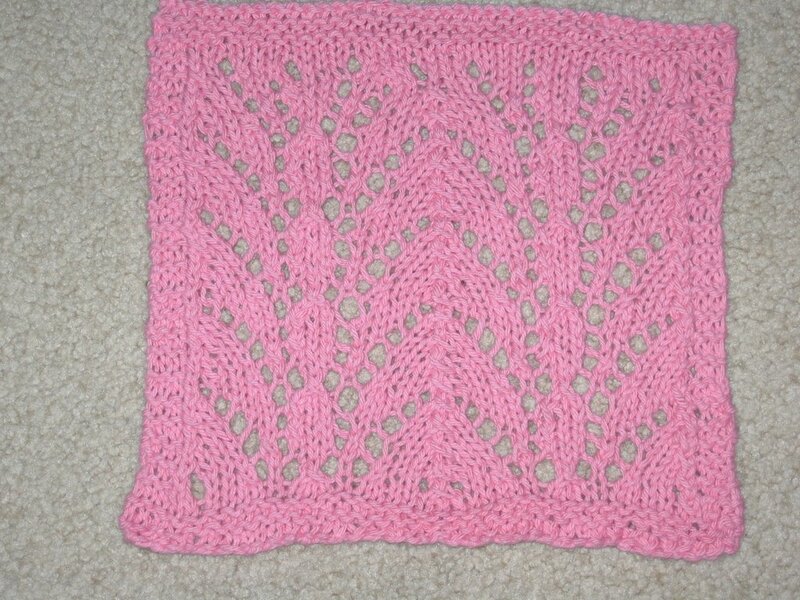 This one is done in tea rose, the color in the picture isn't true to the actual yarn color. I always have a hard time capturing true colors in my photos. 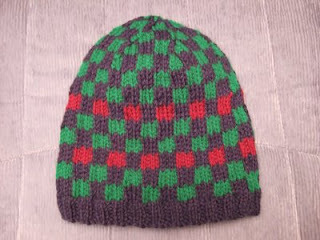 Sorry, I haven't gotten around to typing up the pattern. 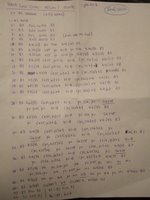 I do have my notes, even the "neat/legible rewrite" version which I could take a photo of and post here for you guys, but I don't think you'd find it very helpful with the kind of unconventional "shorthand" I use. 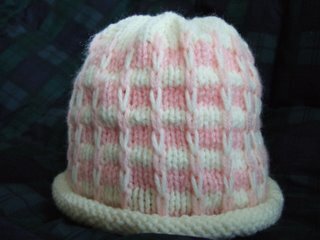 I've finished M's second hat for this winter, it's another Asherton Hat in the same light pink yarn I used for her hat last winter. Yay! 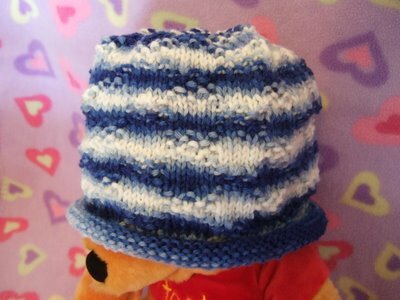 That means I should be able to easily do a swaperoo, letting her play with one hat while I wash the other. M has a thing with hats. She'll often wear them when it's way too warm (nevermind that I try to reason with her to take it off), and she'll hold/drag them all over the place (protesting if anyone tries to take them away from her). I've started another Asherton Hat, in the same light pink yarn, for my Mom since she wanted another hat and decided on the Asherton. It'll be interesting when we're all out together, where M & her grandma are wearing the exact same hat in the same color. lol. 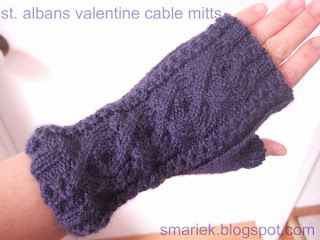 I really love doing cables without a cable needle now. It's so easy once you get the hang of it. 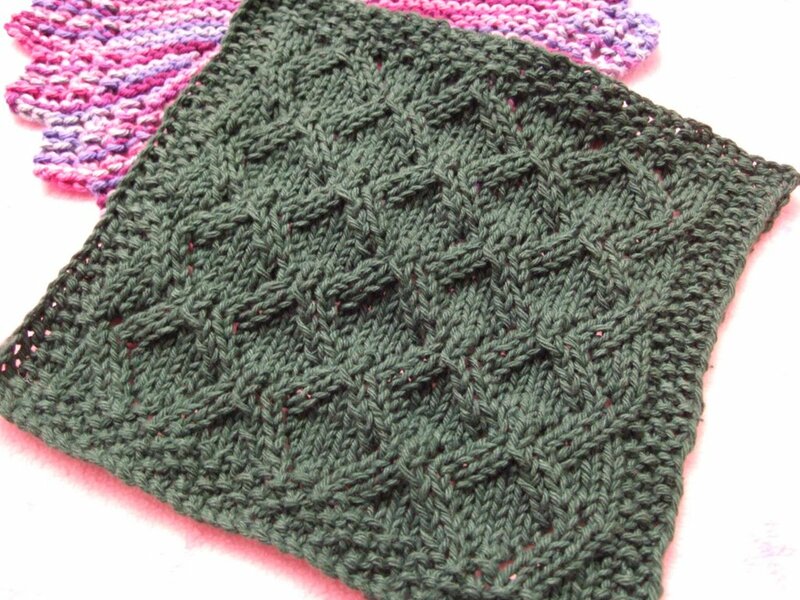 I don't think I'll use cable needles again unless I'm doing a really big cable cross or some kind of really funky cable cross. Let's say you want to do a CF4, a front cross cable involving 4 stittches. 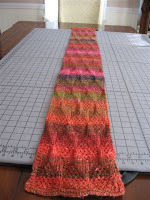 You would normally place 2 sts on a CN & hold in front, knit 2 sts, then knit 2 sts from the CN. Without a CN, you would slip your right needle through the back loops of the 3rd & 4th sts on the left needle. Now carefully remove all 4 sts from the left needle (this is where you use your right thumb & forefinger to help hold the 1st & 2nd sts in place so they don't unravel while they're off the needle) ... so the 1st & 2nd sts are hanging loose, and the 3rd & 4th sts are on the right needle. 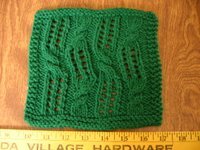 Now you use your left needle to pick up the 1st & 2nd sts, then pick up the 3rd & 4th sts that you had moved onto the right needle. Did that make sense? I think it's easier if you see someone do it. 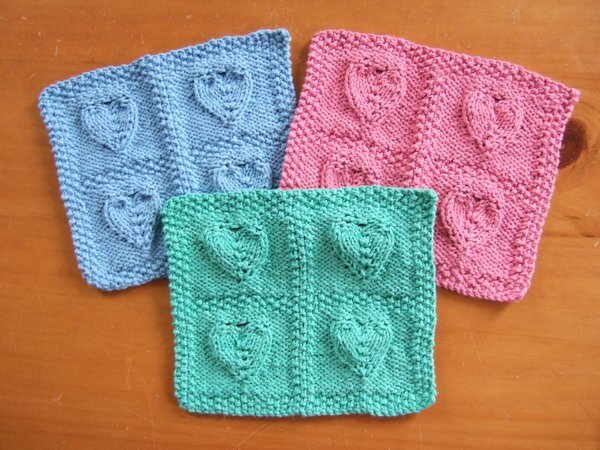 Now that you have rearranged the sts and they are all on the left needle, just knit them. It's similar for CB4, except that you would slip your right needle through the front loops of the 3rd & 4th sts. Remove the 4 sts from the left needle. Pick up the dangling 1st & 2nd sts wih your left needle, then move the 3rd & 4th sts from right needle back onto the left needle. It must sound awkward, but give it a try. Once you're comfortable with it, you'll wonder why you used a cable needle before. I find that the CN breaks my flow of knitting. So now what do I do with the 7 CNs I have??? 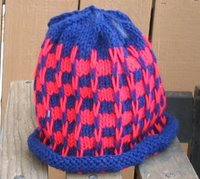 Someone asked me how I knit "in the round". I think most people use circular needles and/or double point needles (DPNs). 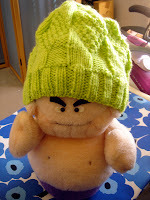 The idea of using DPNs intimidated me at first, plus I do not own any double point needles. 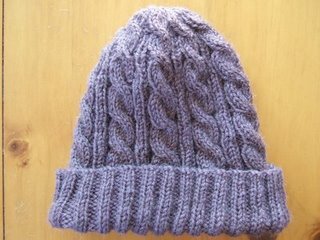 So I spent a lot of time in search of hat patterns (and sock patterns) that were knit flat with 2 needles and then seamed at the end. 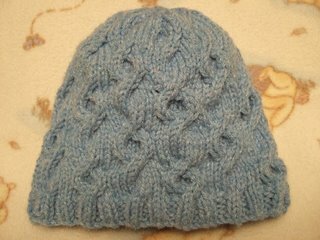 Then I discovered the technique of knitting in the round using 2 circular needles and decided to give it a try on a hat. It wasn't that hard after I got the hang of it. 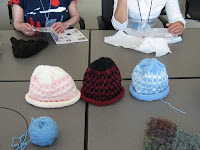 Here's the site I used to learn this wonderful technique: http://www.az.com/~andrade/knit/twocirculars.html . Check it out! 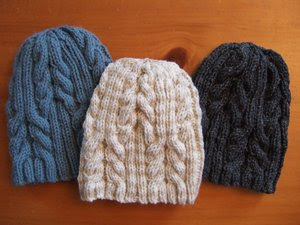 Now I can't imagine going back to any hat patterns that are knitted flat. This is partly because I hate seaming even more than I hate weaving in ends. 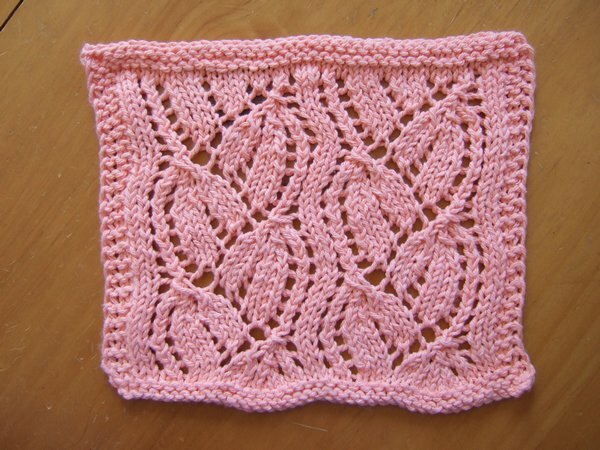 Oh, I just found out that Rachel has made my Heart Lace Cloth the Featured Pattern of the Week on Knitting Pattern Central. Wow, that's wicked cool! Thanks! I had originally planned on posting this on February 14th, for Valentine's Day. 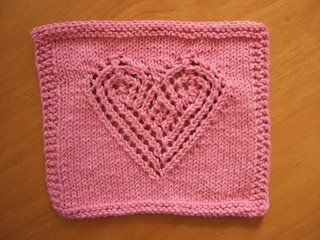 But then it dawned on my that people might be interested in knitting this before V-day. lol. So I'm posting it now. I don't know what I was thinking before... I blame it on M, who is sucking away all my energy and brain cells. 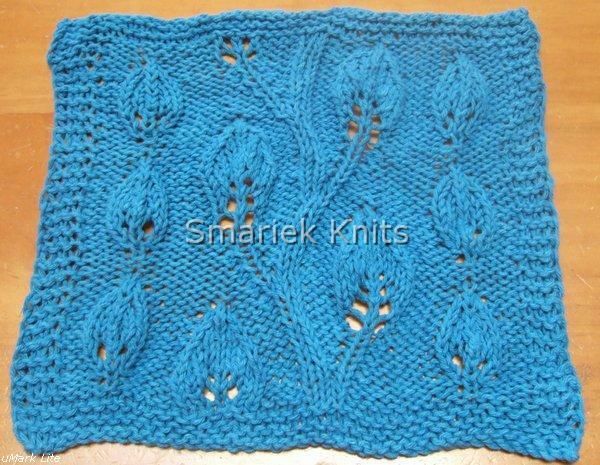 One thing I have always known, and have recently reconfirmed, is that I can't do lace knitting while watching TV. 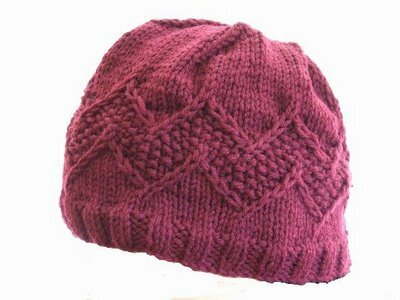 I tried to knit this while watching Cadfael and Prime Suspect 2 (yeah, catching up by watching them out of order), but got nowhere on both. You've probably noticed that I tend to favor lacy designs for my wash cloths. 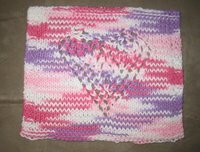 There are three reasons for this: I'm not as talented as the gals who design "picture" cloths; I think they're pretty; I believe they tend to dry faster. Of course that last one might just be my imagination. 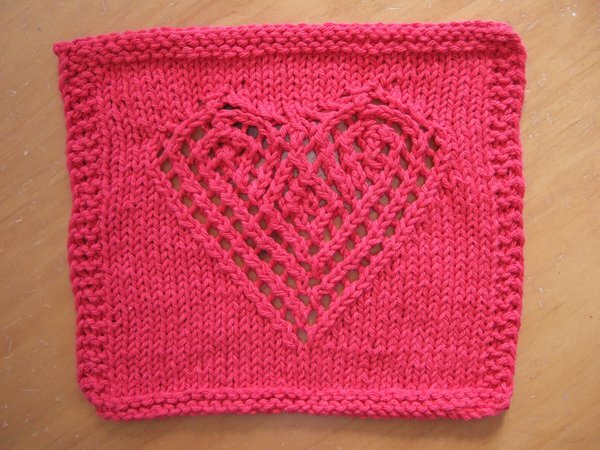 This Heart Lace Cloth is a pretty easy & quick knit. 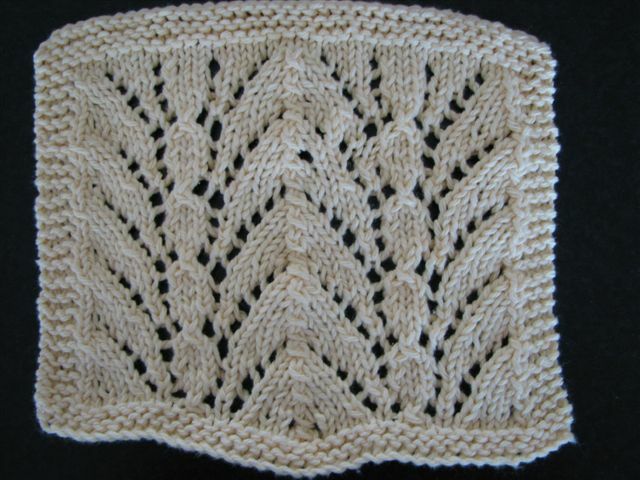 The only trick is to mind your yarn overs. 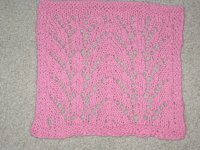 I cast on 39 stitches for the pink cloth using P&C. I cast on 37 stitches for the red cloth using S&C. I usually think S&C is a smidgen thicker than P&C, and I think this is probably why both cloths came out to be about the same size. The red cloth would have been wider visibly wider than the pink one had I cast on 39 stitches instead. Please read "Notes" section at the bottom before starting, particularly the steps for the "M1" increase. 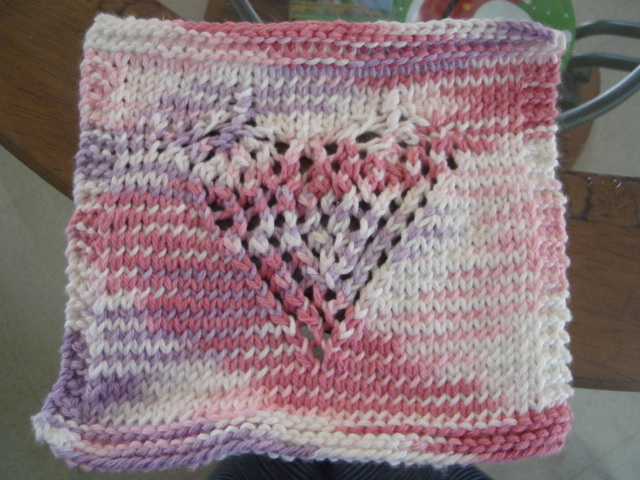 Directions are given for a wider cloth (pink one in photos), and a narrower cloth (red one in photos). 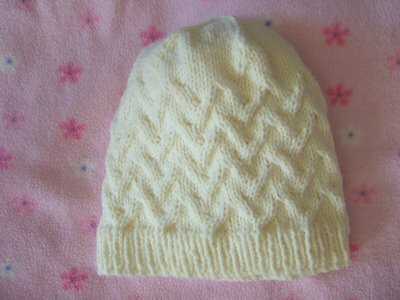 It is narrower only by 2 stitches. Directions for the narrower cloth are given in parentheses. 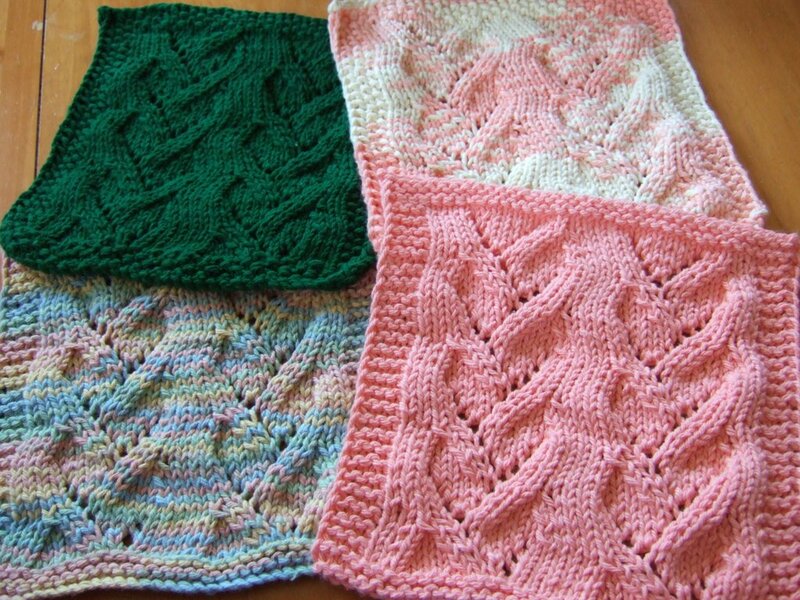 For example, cast on 39 sts for wider cloth, cast on 37 sts for narrow cloth. On row 12, K14 for wider cloth, K13 for narrower cloth. 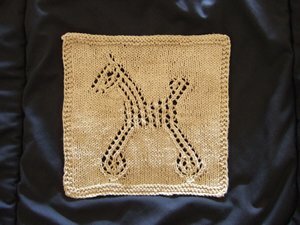 Using WW kitchen cotton and US7 (4.5mm) needles, cast on 39(37) stitches. 9. 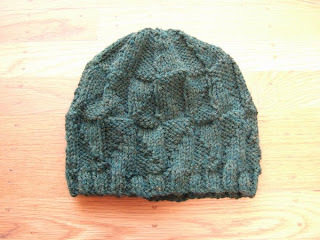 Knit the center stitch. 2. 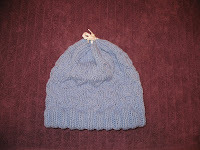 K3Tog (knit 3 stitches together). 3. 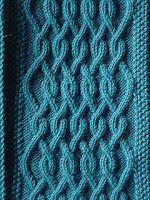 Pass the SSK stitch (from step #1) over the K3Tog stitch (from step #2). Note: I'm adding this alternate version for doing D4 in case the original version above is too difficult. 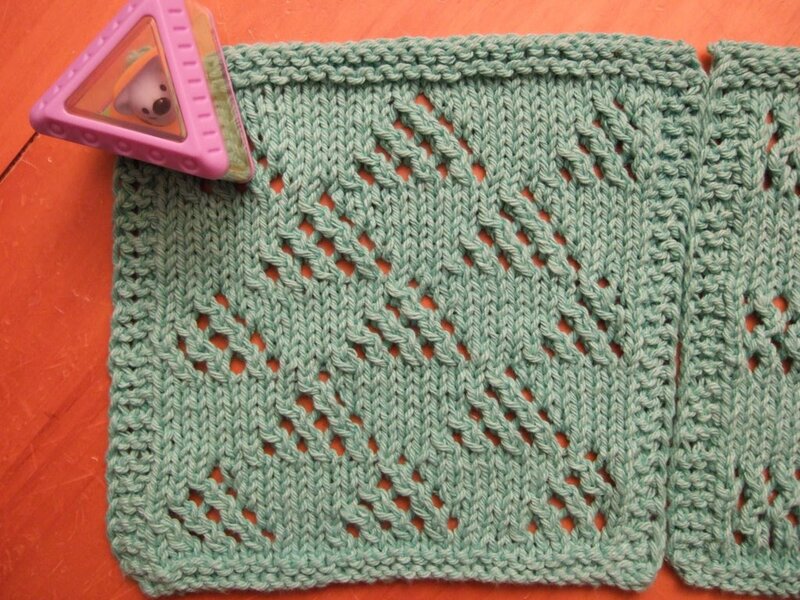 K1-b = Insert needle into the back loop of the stitch and knit it. Instructions in parentheses followed by x2 means you do what is in the paretheses the number of times indicated after "x". For example, (K2Tog, YO)x2 means you would do K2Tog, YO, K2Tog, YO. D4 sounds confusing in words. You're taking the next 5 stitches on your left needle and reducing it down to 1 stitch. Let's number them from left to right as 1, 2, 3, 4, 5. So this means that #5 is on the far right nearest the tip of your left needle, and #1 is on the far left furthest from the tip of your left needle. 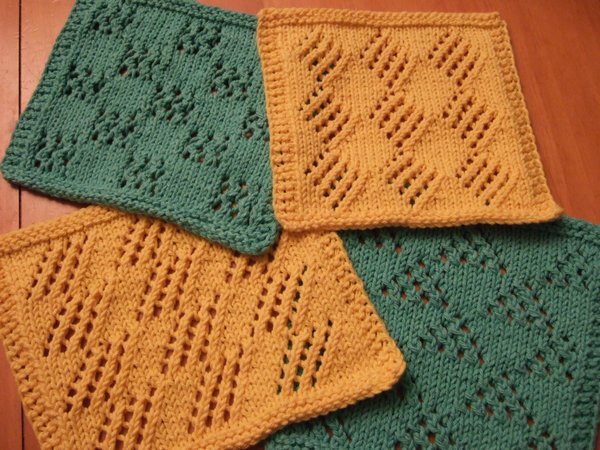 What you are going to do is slip #3, #4, & #5 to your right needle. Then pass #4 over #3. 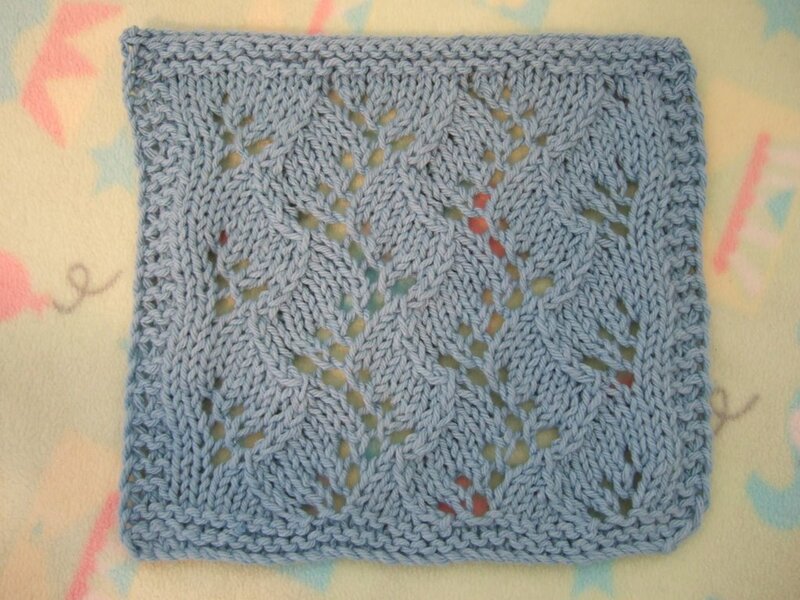 Slip #3 back to your left needle. Pass #2 over #3. 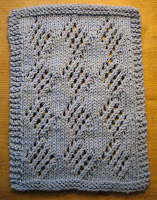 Slip #3 back to your right needle. Pass #5 over #3. 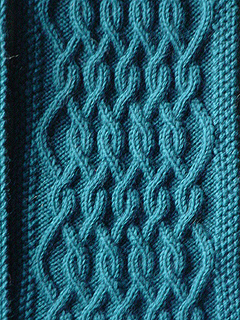 Slip #3 back to your left needle. Pass #1 over #3. 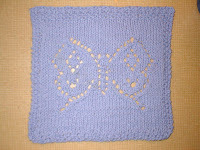 You're left with stitch #3 which you just knit. I hope this sounds clearer? 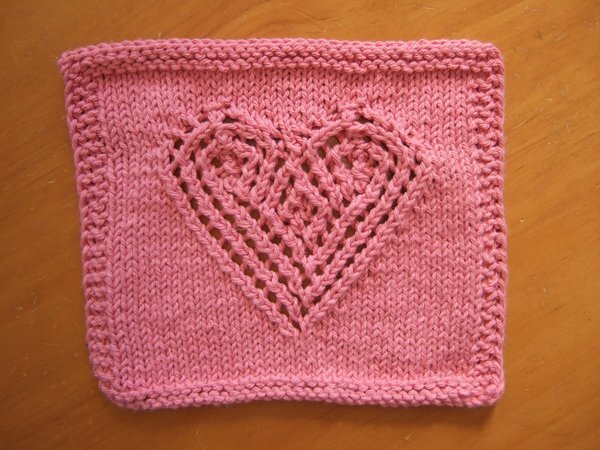 When doing D4, make sure you haven't "lost" your previous YO before you knit the center stitch. 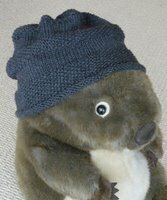 You are Mohair.You are a warm and fuzzy type who works well with others, doing your share without being too weighty. You can be stubborn and absolutely refuse to change your position once it is set, but that's okay since you are good at covering up your mistakes. 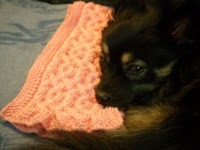 I'm always surprised and delighted when I discover that other knitters have chosen to knit one of my designs. 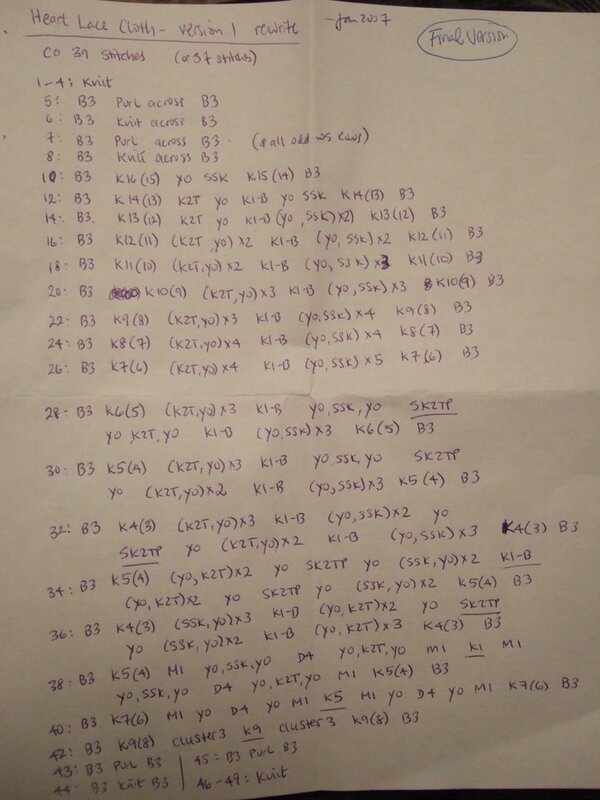 I always wonder who would be interested in such simple and poorly written patterns? (Gauge? What's that?) But I have received email with photos of my designs, and I have also seen them on other people's blogs ... so I guess somebody out there must like them. LOL. Please email me if you would like your photo and a link to your blog (if you have one) to appear here. 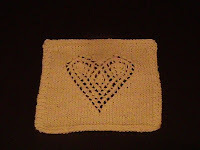 Click on photos to see larger version; click on links to go to the knitter's blog. 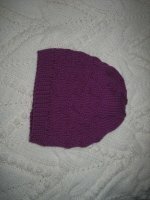 This is Dawn's Asherton Toddler Hat, which she made for Foundation For His Ministry. You'll find her blog here. 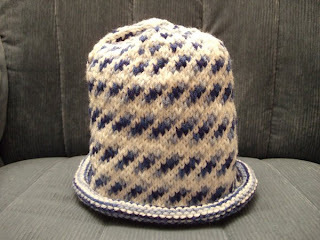 Jenny's Utopia Hat. 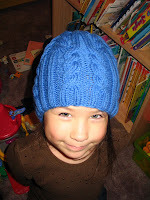 This is the blue one which you can read about on her blog. 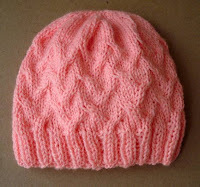 She also made a 2nd Pink Utopia Hat here. 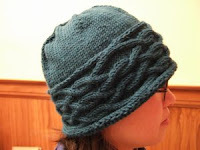 This is WendyDancer's 3AM Cable Hat. 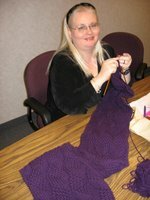 You'll find more of her knitting at her blog or on Flickr. 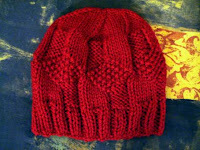 Marce knit 2 of these hats. 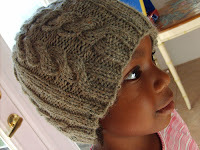 You can see more photos on her blog and on Flickr, where you can see the hat on her really cute daughter! 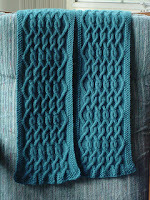 Monica's Utopia Hat & Scarf. 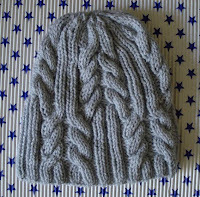 Márcia's also knit the Cap Karma Hat, you can see more photos of this hat here. 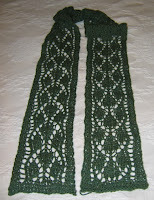 Priscilla's Bonbons and Calissons Scarf. 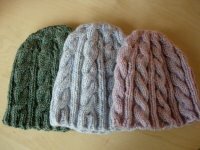 Regina's Asherton Hat, Cap Karma Hat, and Utopia Hat. 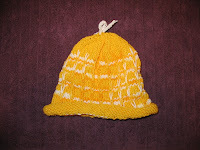 Tinks has made two Utopia Hats. 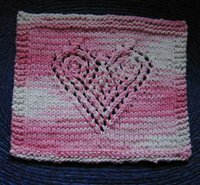 You can see her knitting & crochet photo album here. 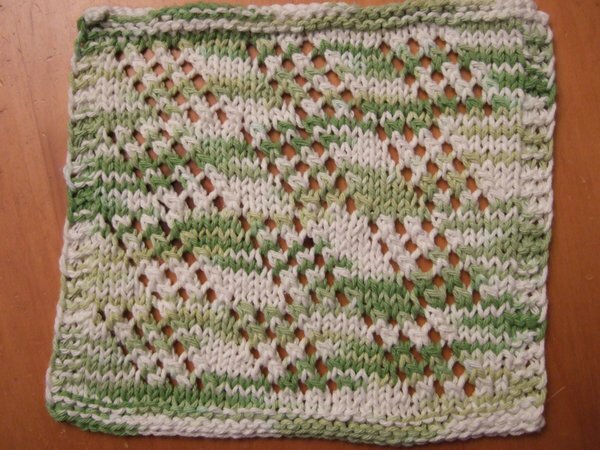 Here's Connie's Turtle Cloth. 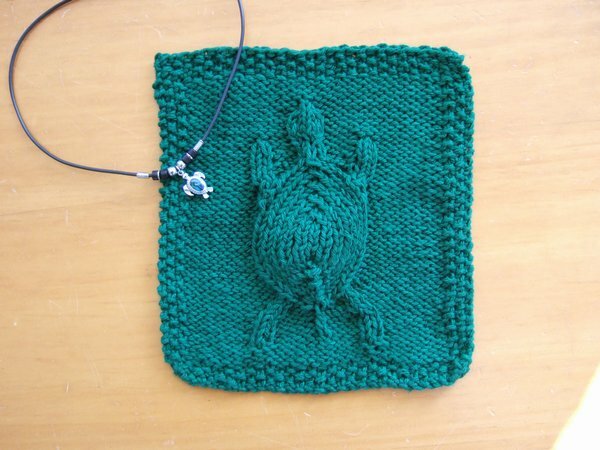 Check out her blog to see a video of her daughter's turtle, Spaz. 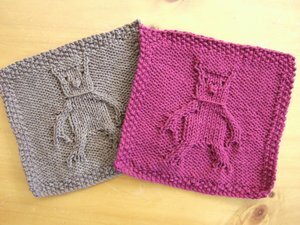 Here's Emily's Turtle Cloth & Bear Cloth; you can see detailed photos of each on her blog here. 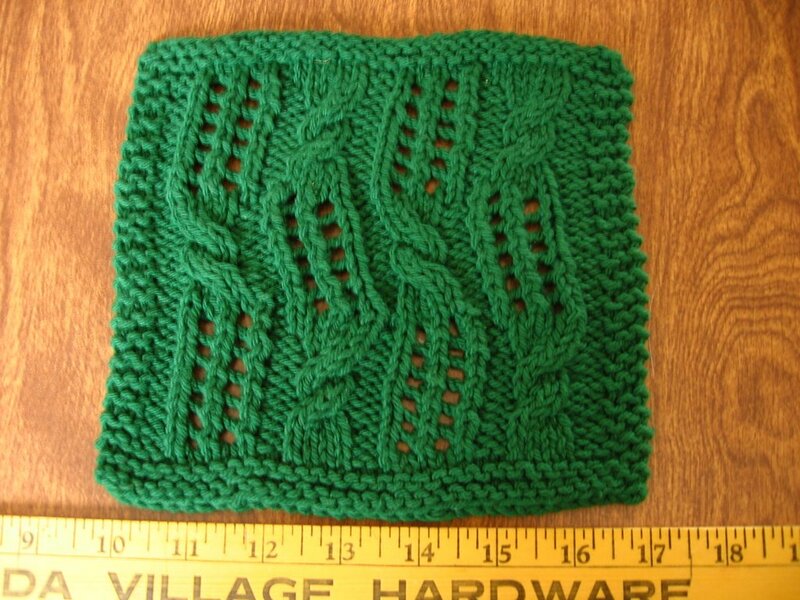 She also did the Twin Leaf Cloth and modified it to make it larger; details in this blog post. 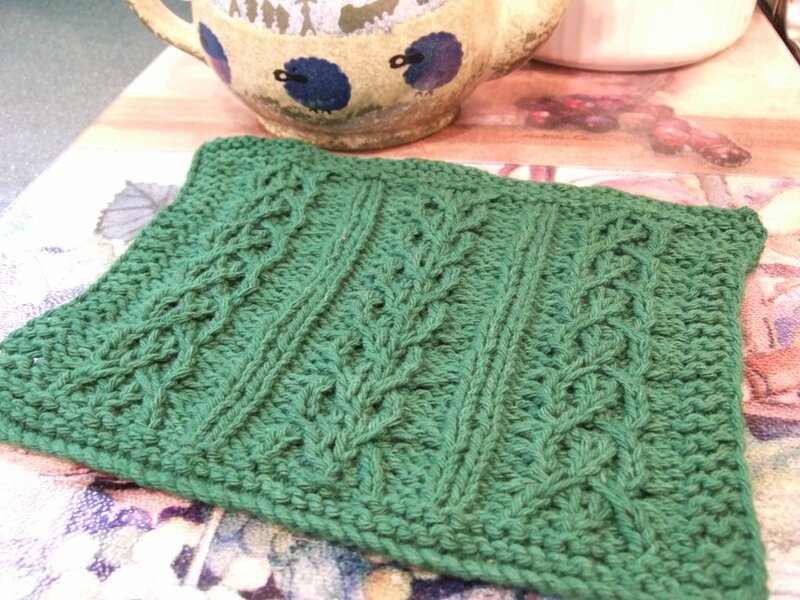 Rhoda's Persephone Scarf. She has another photo of it here. 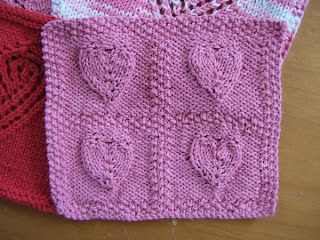 Rhoda has also made the Travelling Vine Cloth and two Heart Lace Cloths. 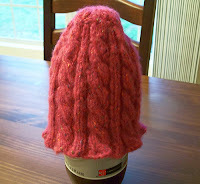 She has a blog, and another place to show off her finished objects. 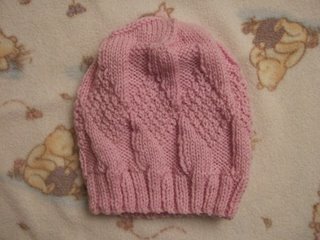 Mieko's Asherton Toddler Hat. You can see her other knitted stuff here. 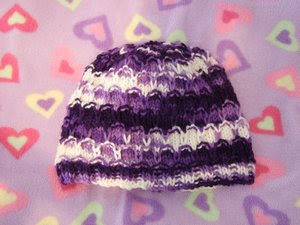 Striped Slip Stitch hats made for Cap Karma. 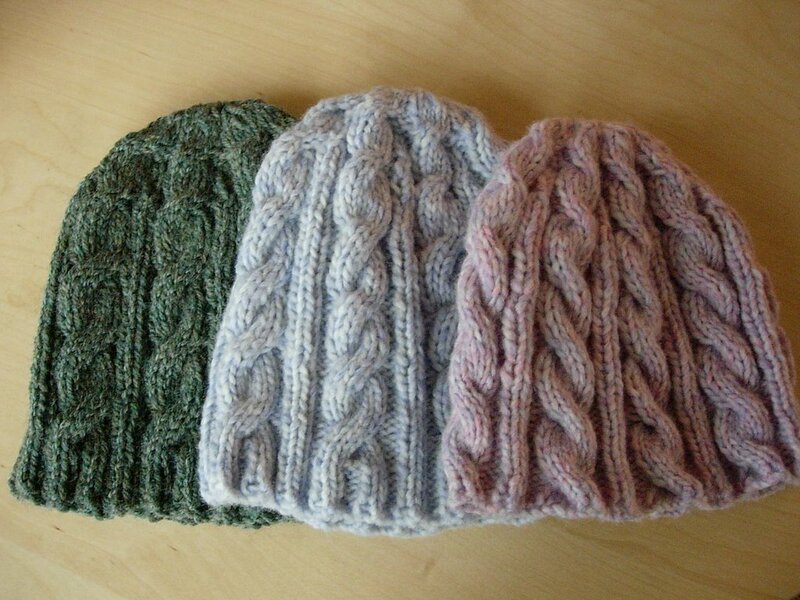 Vicki made the one in the middle. I need to find out who made the blue one on the right. 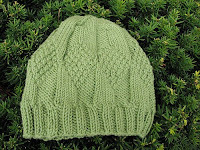 Joanne has made a few of my patterns: Slip Stitch Hat, Heart Lace Cloth, and 3AM Cable Hat. 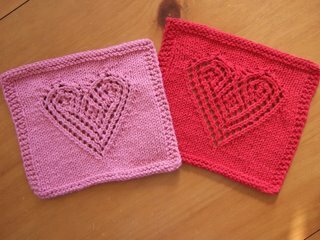 Patty has made a number of my patterns: Dayflower Cloth; 4 Embossed Hearts Cloth; Heart Lace Cloth; Fountain Lace Cloth, knitted for the Fun Knitting Dishcloths KAL. 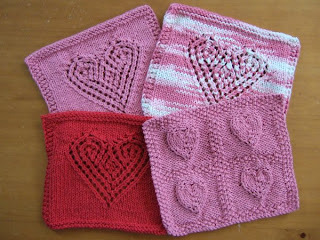 Ce Elle knitted two Heart Lace Cloths. 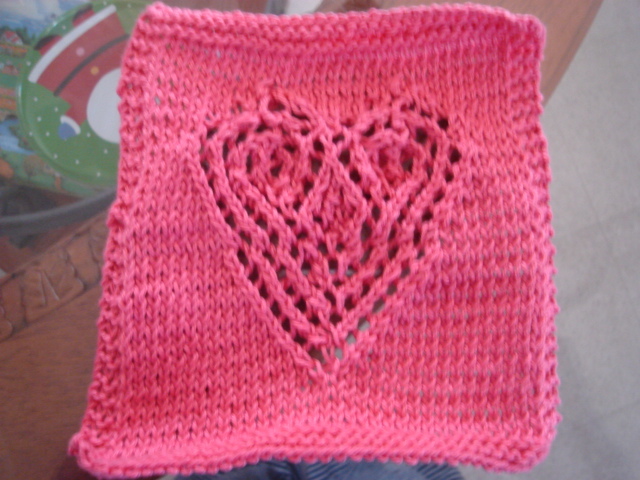 Knitting Lady's Heart Lace Cloth. 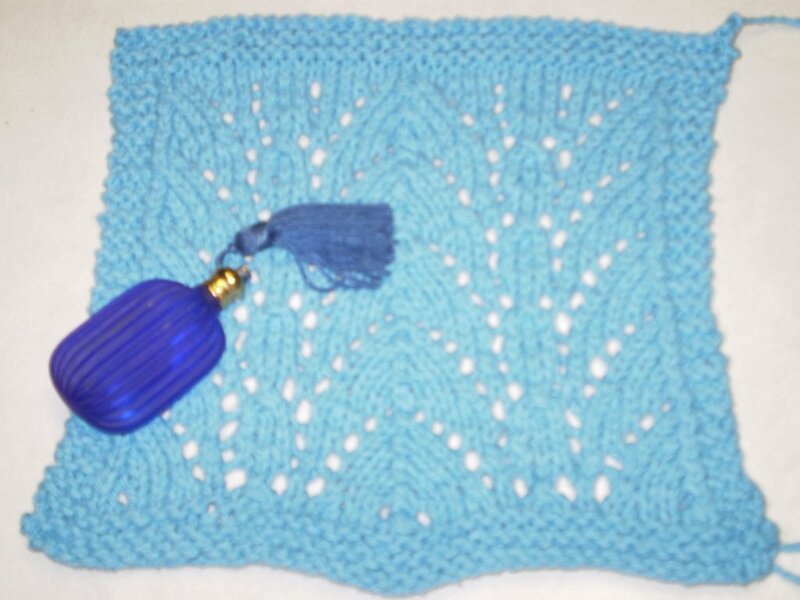 Terera's Fountain Lace Cloth was knitted for the Fun Knitting Dishcloths KAL. 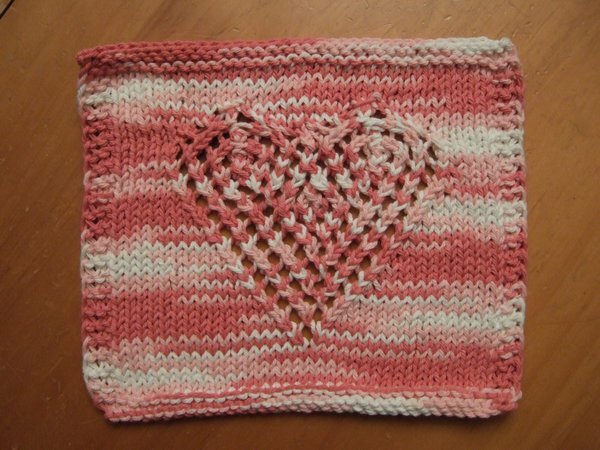 Here's Becky's Heart Lace Cloth. 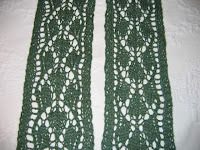 Stephanie's Vine Lace Cloth & Diamond Lace Cloth. 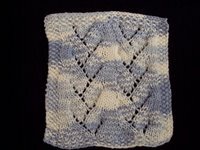 This is Kelley's Woozy Cloth. 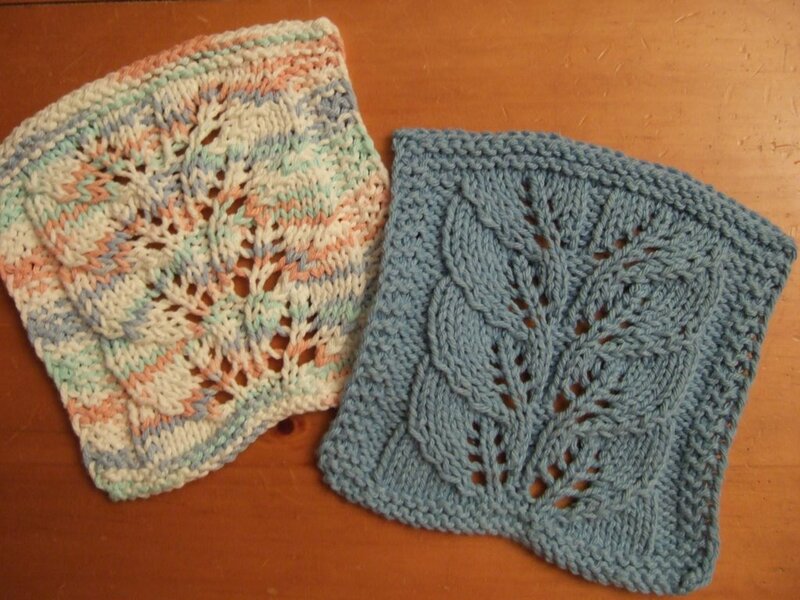 Mona made two cloths, the one on the left is the Fountain Lace Cloth, and the one on the right is the Small Arrow Cloth. 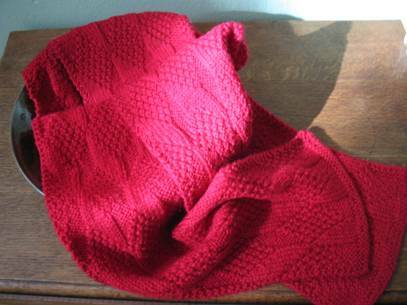 This is Becky's Asherton Scarf, knitted for the Red Scarf Project. 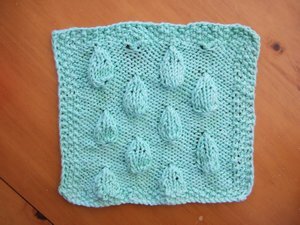 This is Jill's Fountain Lace Cloth which she knitted for the Fun Knitting Dishcloths KAL. 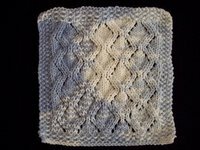 This is Carol's Fountain Lace Cloth, another cloth from the Fun Knitting Dishcloths KAL. 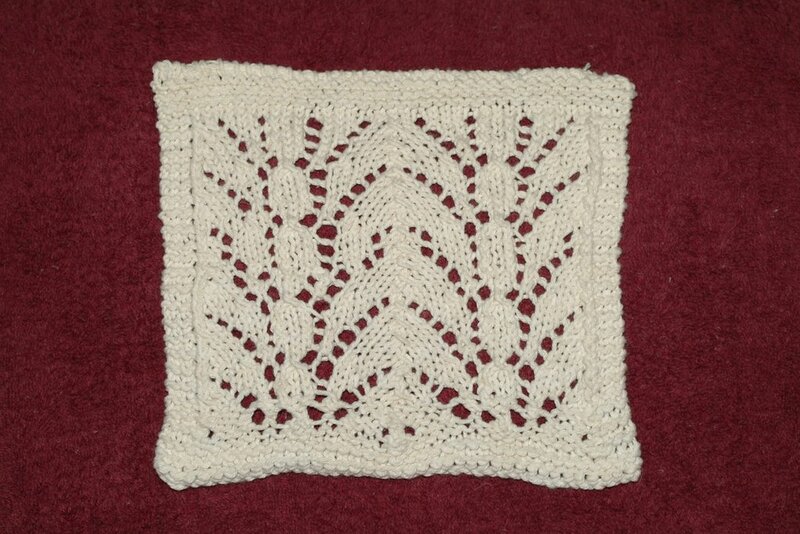 This is Dee's Fountain Lace Cloth. 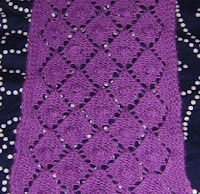 This was knit for Fun Knitting Dishcloths KAL's January KAL. 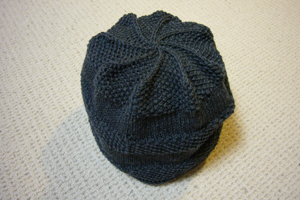 Liz' Cap Karma Hat . I can't figure out why this photo is rotated 90º to the right. The photo on my computer is definitely right side up & horizontal, but it keeps appearing rotated & vertical after I upload it to Blogger. I've tried this 8 or 9 times, no luck. Any ideas how to fix this Blogger quirk? You can see a better photo on Liz' blog. 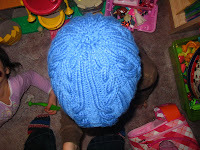 Holly's 3AM Cable Hat, knit with Malabrigo. 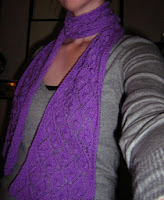 Check out her blog to see a closeup of the colorway, it's gorgeous.